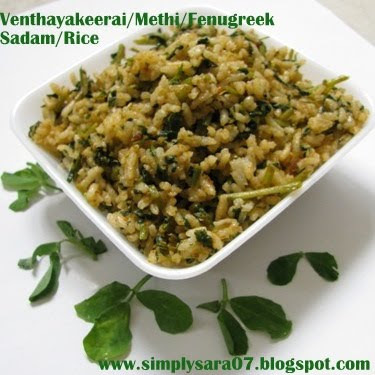 Healthy and yummy rice...I love adding fenugreek leaves to my dishes and this looks great! Beautiful ey catching click.Nice looks so very healthy and delicious. Healthy rice dish. The click is too good and enhances the goodness of the dish. Thanks for sharing a beautiful recipe. Very healthy dish Sara..Rice dishes are easy for lunchboxes..good choice.. This is such a nice way to pu Vendaya Keerai to good use :) I'm adding this to my Little India shopping list!